Ocala–On Monday, August 5, 2013, at approximately 11:05 PM, officers responded to the Panera at 2370 SW College Rd, Suite #101, in reference to an Armed Robbery that had just taken place at the business. The suspect was described as a black male wearing blue jeans, a black hoodie sweatshirt, sunglasses, a bandanna around his face, and one black shoe and one white shoe. On August 8, 2013, Detective Gauthier received information that Erika Nunez and a black male were seen leaving her residence in a gray Chevrolet Impala with a Texas license plate. Detective Gauthier located the vehicle and called for a marked unit to conduct a traffic stop at SW 19th Ave and W. SR40. The person driving the vehicle was a black male by the name of Geron Rashad Jones, Born July 30, 1991. Jones was driving on a revoked drivers license at the time he was pulled over. He was arrested and charged with driving while license are suspended or revoked [DWLSR]. Jones was then transported to the Ocala Police Department to be questioned in the robbery of Panera Bread. Nunez, who was also in the car at the time, was charged with possession of marijuana. Nunez was also brought to the Ocala Police Station for questioning. 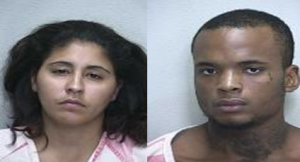 Nunez confessed to having set up the robbery with her boyfriend Jones because she was broke and needed the money. Roughly $900 was recovered from Nunez that was taken during the robbery. The vehicle that Jones was driving was reported in a hit and run on Monday, August 5, 2013 following the time of the robbery. Jones would not speak about the robbery but did admit to leaving the scene of the crash therefore placing him behind the wheel after the robbery. In addition to being charged with [DWLSR], Jones was hit with leaving the scene of a crash and violation of Right of Way. Both Nunez and Jones were booked and are now sitting in the Marion County Jail.